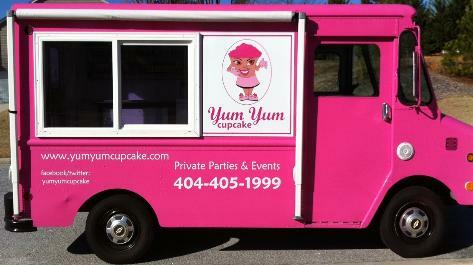 And my weekend goal is to find the Yum Yum Cupcake Truck in Atlanta. Although I imagine I'll still prefer it's classic, older sister, the ice cream truck, I'm on a mission to find this hot pink commodity. I'll report back Monday, hopefully with full details and a list of flavors. Yesterday was unusually gloomy and I found myself in need of a little pick me up. I saw this Martha Stewart recipe for Lemon Meringue Cupcakes on Cupcakes and Cashmere and decided it was the perfect evening project. The lemon tastes summery and they are incredibly moist and delicious (if I do say so myself). My apartment also smelled amazingly fresh and happy - mission accomplished! PS: In case you're going to try them, I replaced the buttermilk with nonfat yogurt to make them a little bit healthier. I realize I'm basically the last person on earth to get on board with cupcakes, but I consider the fact that I'm more of an ice cream girl to be my handicap. Last week, after burning Jim's first birthday cake, and totally messing up the second frozen birthday cake (I know. ), I decided it was time to give cakes a rest. However, I still felt like I kind of owed him a decent birthday dessert, and thought I'd try my hand at cupcakes. So, I had to make a cake. Again. However, this time, I didn't mess it up. It was a chocolate cake with peanut butter icing and although we were way too full for dessert last night, we ate it anyway. And it was very tasty. I'm wearing my J.Crew Chiffon Tiered Ruffle Skirt from last spring today, and it's always the insta-happy because the ruffles make me feel extra pretty. I love prancing around in it. For some reason, when I wear it, it reminds me of a cupcake. Which reminds me of parties, specifically birthday parties. And this only enhances the happiness the skirt brings.